Vaptio Capt'n Kit Review - Daily Vaping Deals & The Best Vape Product Reviews at Vaping Cheap! 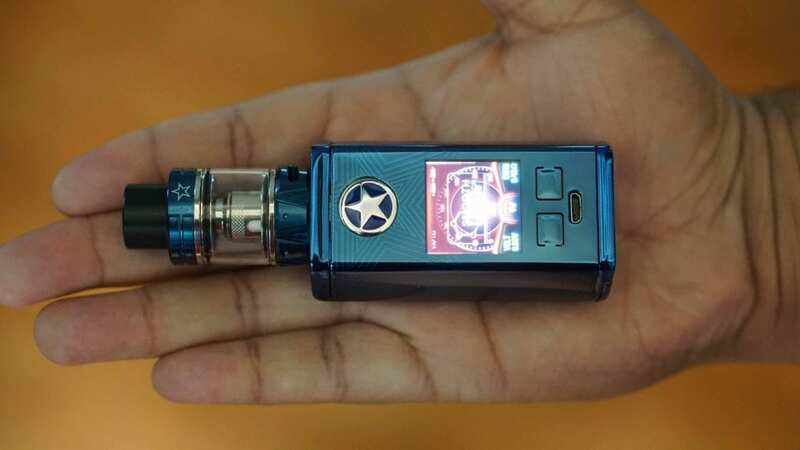 In this review, we’ll be taking a close look at Vaptio’s newest release, the Vaptio Capt’n Kit. This vape starter kit includes the new Captain 220w TC Box Mod, and the Capt’n Tank. The Captain Mod features a premium zinc alloy frame and IML panel body while the Capt’n tank improves upon their previous Frogman tank with a larger area for airflow and a 4ml tank capacity. Before getting any further into this review, we’d like to thank Vaptio for sending this kit our way for the purposes of this review. We’ll cover our first impressions, usage, performance, pros and cons and conclude with whether or not we recommend the new Vaptio Capt’n Kit! Click Here To Check Out the Vaptio Capt’n Kit! The Vaptio Capt’n Kit comes in pretty much the same packaging as previous Vaptio products, which is definitely a good thing! On the front, you’ll see an image of the entire kit while on the back of the box it’ll let you know what’s inside. Included in this kit, you do receive the Captain Mod, Capt’n Tank, a spare Frogman W2 Coil, spare parts and a user manual. The included tank does come with a pre-installed Frogman W8 coil head. The color I received is the blue color variant, but there are tons of other colors available. Some of the other colors include Camouflage Green, Red, Black, Pink, Rainbow and Golden. What’s interesting with the color options is that depending on which color you choose, a different design will be on the device. For example, my blue color has a shield on the back while the red has a bunch of stars on the back. This is a pro in my opinion as you do have the option of having something relatively simple or something really unique. Once you slide open the box, you’re immediately met with the Captain Mod and Tank. My first impression of the Captain Mod is that it looks great! I really liked the mirror finish, although these are known as finger print magnets. It’s also much smaller than I expected, and incredibly lightweight. The Capt’n Tank reminds me just a little of the original Frogman sub ohm tank, but I do like aesthetics of this one much more. The tank also comes in the same blue color, matching the vape mod perfectly! One thing you’ll notice right away with the Captain mod is the fire button is large and has a star on it. Even on the 510 connection, there’s a star logo etched in. While this is something not everyone will like, I will say it did grow on me. The screen is quite large as well, and probably looks a lot bigger than it is due to the actual size of the device. The screen size is 1.3 inches, which is surely on the larger side, and is similar to other newer Vaptio mods we’ve reviewed in the past. I’m happy they kept this screen as I was a fan of it. Something I do want to mention is that the included tank did come loaded with machine oil, so I do recommend washing this atomizer before use. This is definitely a con in my book! Overall, my first impressions of the Vaptio Capt’n Kit were great! I do hate when atomizers come with a lot of machine oil, but I did enjoy the look and portability of the Captain Mod. The Capt’n Mod by Vaptio does require two high drain 18650 batteries for operation, and getting your batteries in and out is easy. It features a sliding battery door that is quite stiff, but securely holds your battery in place. Inside of the battery tray, there is a protection film in there similar to some other devices we’ve seen this year. Be sure when handling the battery tray and inserting or taking out your batteries that you avoid damaging it. I’ve personally had no issues with it, but just wanted to mention that it’s there. The 510 connection on this device is slightly raised, which I assume they did to protect the top of the mod from scratches. The issue with this is that atomizers won’t sit completely flush to the device, which is something that may bother some vapers. For me, it’s not a huge issue as it does protect the device, but some will find this as a con. So I will mention this as a subjective con. Also, there are “A” and “B” markings clear, so you know which battery is which when looking at the battery bar on the display screen. The positive and negative markings aren’t the clearest, so I do wish they would’ve marked it a certain color elsewhere since it’s engraved into the gold plating. Maybe putting it by the “A” and “B” markings would’ve been just a bit better. Inside on the battery tray it is marked in blue and red, but it’s still quite hard to see unless you put it in the light when looking at it. The menu system is basically the same as the Super Bat, so I won’t go into too much detail. Just like many other box mods on the market, five clicks of the fire button will turn this device on or off. Three clicks of the fire button will access the main menu where you can choose between Mode, Setting, Theme and Back. Choosing “Mode” will allow you to switch between smart mode, VW mode, TC mode, curve mods and Bypass mode. In the Settings, you can adjust the system settings, mode settings, vape time, sleep time and more. The Theme will allow you to change the background on the vaping screen and also adjusts the color. There’s only two themes that come pre-installed, which are Red and Blue. The menu system for Vaptio devices are user friendly and pretty straightforward overall, which is surely a good thing and a pro in my book! Another pro is that the screen is nice and bright so it’s easy to see and just a joy to look at. Once the device is sitting for some time, it will rotate between two different images, which is something you may or may not like. One is the logo for the Capt’n and the other is for the chipset. I will say that this device is very lightweight even with two batteries installed, and when mixed with it’s compact design, it’s very pocket friendly. This box mod just feels really great in the hands with no sharp edges whatsoever. They did an excellent job with the design, and I was impressed with it’s form factor and comfortability. 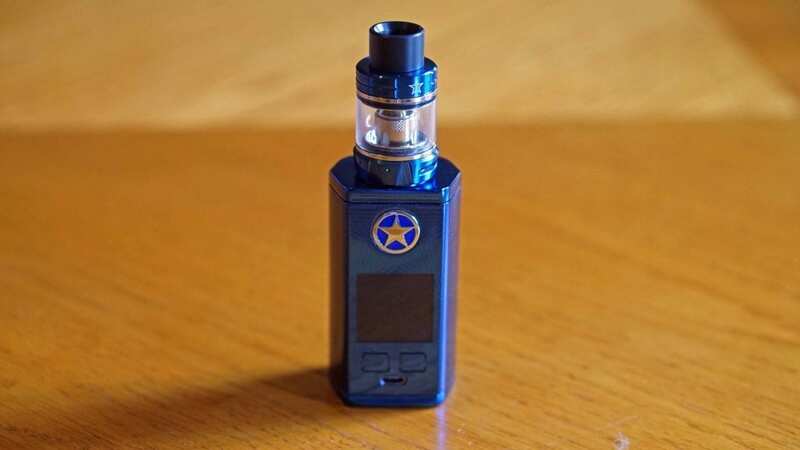 One last thing I want to mention with this device is that it does one watt increments, which is something a lot of vapers prefer including myself! The Capt’n Sub Ohm Tank is a pretty straightforward vape tank. It features adjustable bottom airflow with the perfect amount of tolerance when adjusting. It’s not too loose nor is it too stiff. The drip tip design is very similar to the Aspire Cleito, so you’re not able to really use any of your preferred drip tips. This is more of a proprietary drip tip design, which for me is a con. The actual drip tip slides onto a protruding metal piece with o-rings at the top of the tank, and it does stay in place with no issues. In regards to coils, it’s a traditional style tank where you can unscrew and screw the coils into the base. It also features a threaded top fill design which takes only a few turns to open. The fill ports are of a generous size so you’ll have zero issues when it comes to filling this sub ohm tank. All in all, using this vape starter kit as my daily driver has been a great experience. Although you’re not able to use your own preferred drip tips with the Capt’n tank, the included drip tip is comfortable and doesn’t get hot since it’s constructed of delrin. The Captain Mod was a joy to use! I really loved the fact that this device was compact and incredibly lightweight even with 2 batteries installed! 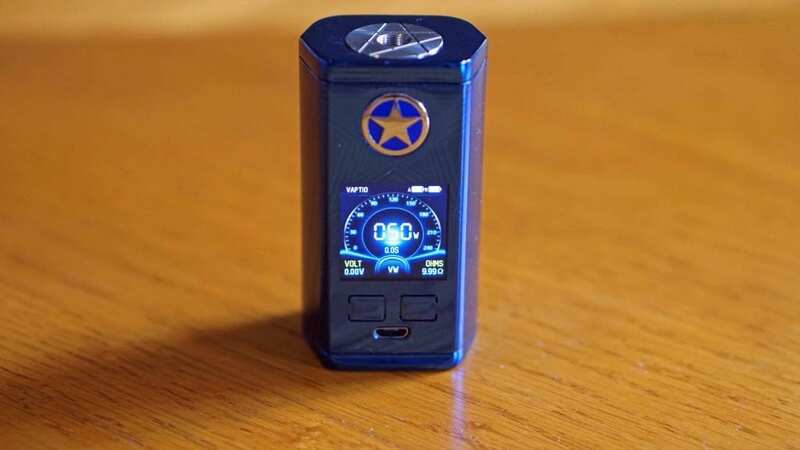 The Vaptio Capt’n Mod does have a maximum wattage output of 220w. While I don’t have the equipment to test it’s accuracy, I will say it does feel like it offers around 200w, which is still plenty for most vapers. I personally don’t vape that high of wattage nor does the tank included require that kind of power. However, I do think this device will provide enough wattage for the vast majority of vapers. If you are vaping at higher wattages I do recommend 18650 batteries that offer higher CDR such as the Sony VTC5A. This device performs perfect in wattage mode and I was satisfied with its performance. I did use this device in wattage mode for majority of the time I was vaping with it, and I had zero issues. In addition, this device fires instantaneously with no delays whatsoever, which is always a good thing! There are curve modes available as well if that’s something you enjoy, but honestly I didn’t use it much. It does work just fine though. In regards to temperature control, it works very well too. I did test TC mode with a simple 24GA stainless steel build and it felt pretty accurate. I didn’t experience any dry hits, so I will say that TC for this device is good. I would say it’s slightly better than some other chipsets on the market, but not nearly as good as a YiHi or DNA powered device yet. The battery life is great and of course this is subjective as depending on how much you vape and the wattage you’re vaping it will impact the battery life. While vaping between 50w and 70w I could easily get through all of the day. However, if I were chain vaping at higher wattages, I would have to switch out the batteries after about half the day. I will say that you could probably get through a full work day with no issues. It’s pretty on par with any other dual 18650 device on the market. The Capt’n Tank is also solid performing. I won’t cover too much with the coils as we’ve reviewed other tanks from Vaptio that utilizes the same Frogman Tanks. However, the Capt’n does provide a bit more airflow and is much easier to fill in my opinion. The airflow is very smooth wide open and fairly quiet. However, when you do close off the airflow, it does get a bit louder, but still quite smooth overall. I will say I do prefer this sub ohm tank over the original Frogman. They basically took an already good performing tank and made it better. The flavor and coil longevity of the Frogman Coils are still great. I do wish this kit came with some newer coils such as replacement coil heads with mesh wire. I think those are coming soon and will update if these will be available. I wouldn’t necessarily mention this as a con, as I do think the included coils are good, but still worth mentioning. 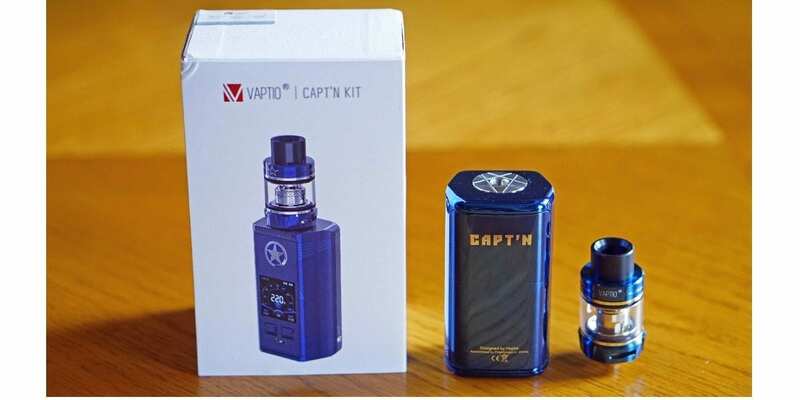 Overall, the Capt’n Kit is another great performing high wattage starter kit by Vaptio! I had no issues when using the mod itself, and the Capt’n tank is simply a better atomizer than the original Frogman. In conclusion, the new Capt’n Kit is another great starter kit coming from Vaptio. It performs well in pretty much every aspect and just looks great, especially with the blue mirror finish. In addition, I really enjoyed carrying this device with me during the day due to its lightweight and compact design. The tank did bring some great improvements with airflow and top fill, which is definitely a welcomed change over the previous Frogman tank. There were some cons to this vape kit such as the proprietary drip tip and the raised 510 connection. For me, it didn’t bother me much as I did find the included drip tip quite comfortable and I know the raised 510 is to protect the top from any type of scratches. If you’ve had any other devices with a similar mirror finish then you know for sure that they’re fingerprint magnets. Not much you can do really, but I didn’t mind it much either. However, I know some vapers simply hate that, so it had to be mentioned. All in all, I do recommend the Vaptio Capt’n Kit for anyone looking for a new high wattage vape starter kit. It performs great and looks just as good! We hope you find this review helpful in finding the right vaping kit to fit all of your vaping needs! Feel free to leave any questions or comments down below! Thanks for reading our Vaptio Capt’n Kit Review!